After the grand success in 2015, Anjanee's Creation is back again…. 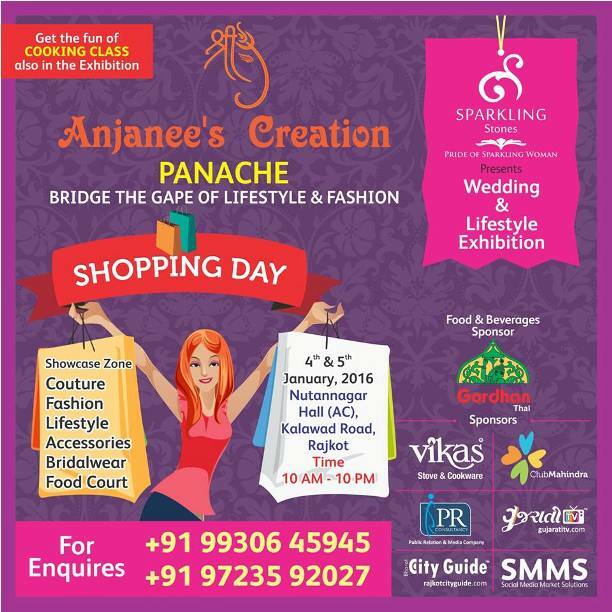 Sparkling Stone presents Anjanee's Creation Wedding & Lifestyle Exhibition in Rajkot. Anjanee's Creation Panache Bridge the Gape of Lifestyle and Fashion because the fashion exhibition is back with the participants from over India. The Anjanee's Creation Wedding & Lifestyle Exhibition will be held on 4 and 5 January at Nutannagar Hall Rajkot. Anjanee's creation is back in town to serve the people of Rajkot with something new, different, exciting, bigger and better in Wedding & Lifestyle Exhibition. Get the Fun of Cooking Class also in the exhibition. In Bridal and Lifestyle Exhibition 2016 there will be traditional wear, accessories, smart western, dress material, saree, wedding costume & accessories, and much more fashion items of the latest trend and style in the Panache event. In the exhibition there will be cooking also so ladies the fun and enjoyment is waiting for you on 4 and 5 January. So get ready for the shopping in the starting of the New Year 2016 and buy stylish outfits from the Anjanee's Creation Wedding and Lifestyle Exhibition Rajkot.